Because cow's milk offers vital nutrients, fat and protein, it often seems like the best beverage option when compared to sugary, caffeinated drinks. However, sometimes intolerance to cow's milk can develop, making it necessary to locate a milk alternative. Although soy milk can often be a good replacement, it isn't without its own side effects. According to the Diet Channel website, toddlers that drink soy milk as opposed to cow's milk can develop a deficiency in calcium. Calcium is responsible for building and maintaining a child's teeth, bones, muscles, central nervous system and even hormones. This makes this nutrient extremely important for a toddler's development and growth. Although some brands add calcium and vitamin D, soy milk doesn't naturally provide these nutrients. 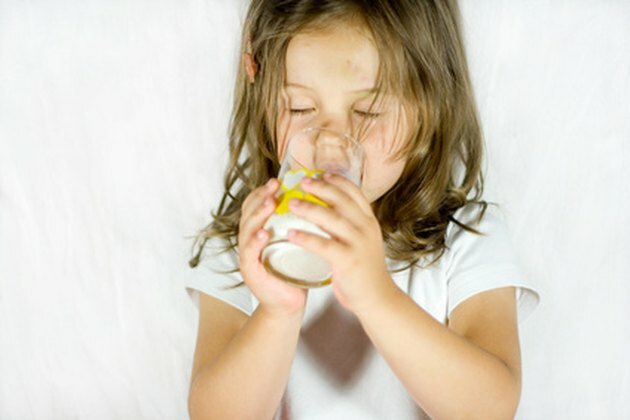 Because cow's milk comes naturally with around 25 percent more protein than soy milk, the Diet Channel website warns that toddlers can develop a protein deficiency from soy milk. Protein deficiency can cause serious side effects. The Merck website says that children may become weak, lose fat and muscle, experience a decrease in the heart's size and develop a lower pulse, blood pressure and temperature. In extreme cases, organ failure can occur. To combat these dangers, be sure your toddler is getting protein from other sources like meats, eggs and beans. The Weston A. Price Foundation says that phytoestrogens found in soy milk can cause disturbance in a toddler's thyroid hormones. Thyroid hormones function like a neurotransmitter. But the soy estrogens located in soy milk can block them, causing a myriad of symptoms. Children may experience loss of memory, slowness, confusion, hair loss, fatigue, constipation and even brittle bones. In addition, a low thyroid function can also contribute to heart disease. The Diet Channel: Soy milk: Healthy for Children?